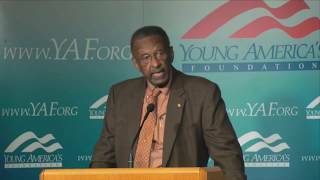 Walter E. Williams, the John M. Olin Distinguished Professor of Economics at George Mason University, is a well-known lecturer and social critic respected for his logical discussions of current issues. Formerly a national fellow at the Hoover Institution and a professor at Temple University, he is currently an adjunct scholar at the Heritage Foundation and the CATO Institute. Williams is a graduate of California State University and UCLA. Williams is a nationally syndicated columnist of over 150 publications which have appeared in scholarly journals such as the Cornell Journal of Law and popular publications such as Newsweek, National Review, Reader’s Digest, and Cato Journal. He has written several books including The State Against Blacks: A Minority Viewpoint andAll It Takes Is Guts. He has been featured on numerous radio and television programs, including Crossfire, Face the Nation, Larry King Live, Milton Friedman’s Free to Choose, The Rush Limbaugh Radio Show, and William F. Buckley’s Firing Line. Williams serves on several boards of trustees/directors including Cato Institute and Heritage Foundation. He has received a number of fellowships and awards including the Hoover Institution National Fellow. He has participated in debates, conferences, and lectures in the United States and abroad. He has frequently given expert testimony before Congressional committees on public policy issues. Williams stars in the Young America’s Foundation’s film The Conservatives to defend the morality of the free enterprise system.